Main Street Bartow, Inc. and Bartow Cycling Events are all geared up for the Bloomin’ Bike Ride on March 5th, 2016. 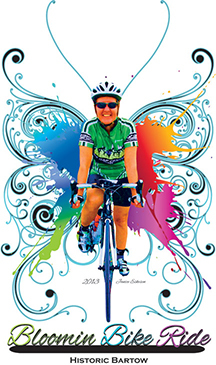 This companion event with Bartow’s Bloomin’ Arts show and Bloomin’ 5K, is an on-road cycling tour along the scenic back roads of southern Polk County. Gently rolling roads take our cyclists across the Peace River Basin through expansive citrus groves and around the old Florida backwoods. Additionally, this is a cycling event that sets Bartow apart by providing great cycling support via fully stocked rest stops with friendly volunteers, trailing vehicles for assistance and aid, course photographer, cool goodie bags and great food provided by some of Bartow’s finest restaurants that keep our cyclists coming back to experience even more of our hometown cycling hospitality! Cyclists come from all over central Florida for the Bloomin Bike Ride & the Tour de Tow cycling events and fall in love with Bartow’s hospitality and the creature comforts of our City. The ride logos feature cyclists that have won the Artistic Motion Award that is selected from a drawing before each ride. They will be seen on our ride shirts, posters, and all promotional material. The POWER PEDALERS is a program that makes good use of the proceeds from both the Bloomin’ Bike Ride and the September Tour de Tow to purchase bicycles for foster care kids. This is a great encouragement to help cultivate a love for cycling and a healthy lifestyle for the children. The staging area for the Bloomin’ Bike Ride is the southwest side of Ft. Blount Park. Registration opens at 7:00 a.m. and the ride begins with a special presentation at 8:00 of new bikes to the POWER PEDDLERS. This year’s ride will feature a 65- and 35-mile road tour and an 17-mile family fun ride. Registration is at Active.com, or you can register the day of the race. Sponsorship opportunities are available for both rides, please email Lillycat36@aol.com or call Trish or Bob Pfeiffer at 863-640-1024.